Home Wellness	Can Influencers be Influenced? It’s no secret that I spend a lot of time in the online space both for this blog and my day job on the BabyCenter social team. I see a lot but I’m in a strange place when it comes to how I absorb information. Am I a blogger? Well, in the technical terms, yes of course I am because here we are. But am I a full-time successful blogger? Well, no because I have a full-time job and there aren’t two of me. Do I have influence? Absolutely. 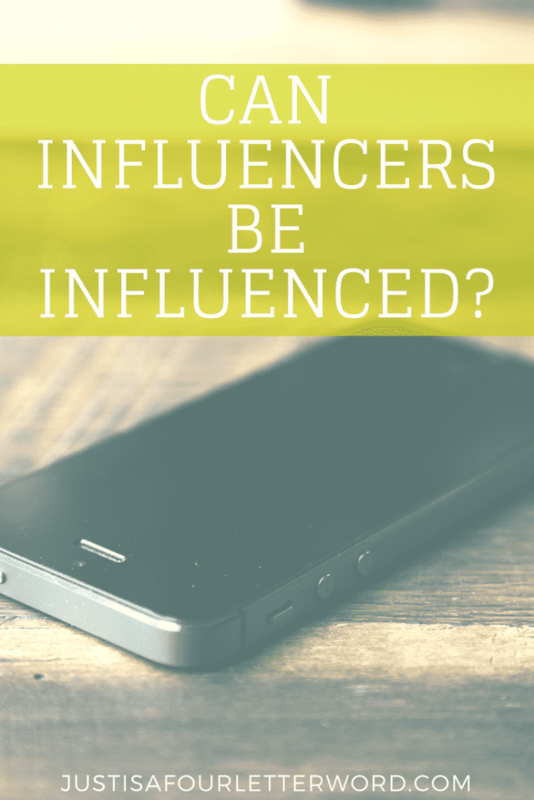 Can influencers be influenced themselves? Yes! As a social media professional, I work with brands and learn platforms and read all about ads and budgets and marketing strategies. I read about the rise of fake influencers and the fall of real influence. If you’re a blogger, you’ve no-doubt seen this statement over and over, “yeah but the only people who follow xyz person are other bloggers.” Typically, people say this to reinforce the idea that other bloggers aren’t real followers or they are just there for their own gain. Could be, but in what other business is networking a bad thing? And that’s where things get tricky for both brands and bloggers. Perception is a big deal online so anyone worth their salt is taking stock of how they are seen on any number of social media platforms. Images are created and curated, friendships and alliances are formed and deals are made. It’s like Survivor, but with cute coffee mugs. The truth is, we know each other and we form working relationships and friendships based on common interests, so it stands to reason that yes, we absolutely can be influenced. I am influenced all day by other influencers and I want you to know that I’m ok with that. I’ll be the first to tell you how jaded I am about the internet. I’m like, whatever you would call the internet version of a stereotypical hipster. If you show me something funny, I’ve seen it already. I know how the joke ends and yes O-M-G yes I can actually believe what happens next. I’ve been using some form of the internet since around 1994 and while I still love it just as much as the old days, I’m a bit more streetwise. No I don’t like change, but I do adapt eventually. Y’all I even like Instagram stories now. How did that happen? The secret to influencing an influencer, is trust. Of course, trust really is the key to unlocking any kind of meaningful brand/blogger/reader relationship, but it’s especially so for those of use who know the ins and outs of how to make things happen. We can spot a scam a mile away and know when a post is sponsored even without the disclosure. Some of us are whistleblowers, while others quietly make lists of who not to work with or recommend to brands, just like any other business. And if you think PR companies and brands aren’t doing the same exact things, think again. So how can we win the trust of our peers? I have a few ideas. Here’s a little case study for you from personal experience. I’m really loving Instagram these days so I’ve been spending a lot of time over there liking, commenting and following various influencers. I enjoy fashion for moms so lately I’ve been following more women who post in that category. For the past year or so, I’d noticed a call-to-action to shop the image with an app called Like to Know it. I hated it. It bothered me that I had to open another app to simply find out the brand of clothing these people were wearing. Why couldn’t they just tag the brand?? Just who did they think they were, anyway?! I was shooing them off my lawn before I even gave them a chance. Eventually, seeing all of these posts wore me down until curiosity got the best of me and I downloaded the app. And guess what? I love it. Taking screenshots is obviously really easy and ends up saving time because I don’t have to go shop the look right away. The images are all saved in the other app ready for me whenever I’m ready. Consistency won me over and it happens over and over again. And no, I wasn’t paid to say that, which leads me to my next point. Don’t lie about your sponsored posts. Please. If you’re making money as an influencer, it’s ok to own that. It’s 2017 and no one is buying the lie that you are simply doing what you love and getting nothing in return. Celebrate the work you you earned and own it when you have a new job. Not only is it the law, it’s just good business. Your engagement can never be lower than being shut down for non-compliance. Think about the long term for your own good. If you’re a brand, never ask an influencer not to disclose. It’s bad business and illegal. Seriously, it’s a wonderful time to be alive. Parents can be more flexible than ever in their careers and we can create true and meaningful conversations with each other. But not under the veil of unethical practices. As a blogger, I’m a member of quite a few networks that offer sponsored opportunities. I could probably apply to 5 campaigns each day (on the conservative side) and maybe I would be hired for a few. But I actually rarely apply because out of those five jobs, they may not be a fit for me. Over the past decade, I’ve learned that it’s better for everyone when I don’t apply for everything or say yes to every opportunity that comes my way. Sure I like to try new things, but I always take stock of how I would feel hitting publish for every opportunity that comes my way. Is this something I would want to share? If not, the answer is keep moving. I’m a very devoted fan when I want to be. I love Lou & Grey clothing and visiting Walt Disney World and AHAVA hand lotion (affiliate). Shopping at Target and drinking coffee are second-nature and in many ways, I’m as basic as they come. Those who know me in person or online, would know immediately if I was being inauthentic. As I said yes to the wrong things over the years, I began to have a physical reaction. Oh yes, a gut check for sure. Now, I don’t even apply to those campaigns and it’s so much better that way. When you call yourself an influencer remember, this is your name, your likeness, and your endorsement. Being authentic is your currency. Know your worth. Ironically, the first time this lesson really hit home for me was right after I wrote the book, Klout for Dummies (which you can still get for $1.99 at Barnes & Noble). That year, I had a parenting book idea that I’d been pitching to various publishers with no luck. Then at a conference, I sat next to a publisher by chance and we struck up a conversation. I followed up with her after the conference and pitched my book. She politely declined but then asked if I would consider writing a book about the new (at the time) influence measuring site, Klout.com. After giving it some thought, I decided that the experience of being published was more important than truly loving the subject matter. After all, it might be easier to get my parenting book picked up if I already had been published. I knew enough about Klout to have an account but to also know about the negative press it was already getting. How could an algorithm truly measure one’s influence? I decided to leave that up to the reader and take the job. The process took me six months and was one of the hardest things I have ever done. I spent hours upon hours away from my family and away from this blog, writing about a topic of very little interest to me. On top of that it was a very technical, how-to book about how to use the site. A few weeks after my book was published, Klout released a complete redesign on the entire website and basically rendered my text almost totally obsolete. Just like that, it was over. I couldn’t even promote the book in good conscience. I mean, how could I when everything had changed overnight? It was a hard lesson in how quickly things can change and while I am glad to have had the experience of what it’s like to become a published author, it was an expensive lesson. I won’t say I regret it, but I wouldn’t do it again. I did a great job on that project. But it wasn’t me. I didn’t own my influence and I do think it cost me something in my online presence. What might have happened if I had used that 6 months to go full-on with this blog? Who knows. In short, influencers can be influenced. In fact, we may be among the most influence-able™ people out there because of our voracious curiosity about the world. Most of us are here in the first place because we love finding new things and sharing them. And when we can turn that into a living? It’s a dream. What do you think? I’d love to hear your input in the comments below. And be sure to tell us if you are a reader, influencer, brand, agency or something else. How does an influencer win your trust? Great post, Andrea. I think influencers don’t have to be loud or noisy, as long as they are authentic and trusted by their online/offline audiences. I was a blog reader/follower long before I ever became a blogger myself four years ago. I even subscribed to a few deal bloggers as I was an extreme couponer and still subscribe to several of those. I prefer to accept influencer campaigns for products I do or would use in my own home. We are currently involved in influencing a product we fell in love with when we tried it and will continue to have in our groceries for years to come. It’s much easier to be genuine about products we already use. I am influenced by other blogs as well even now. I love finding new products to try and hearing a genuine experience from real people who have tried them already. Yep and you start to develop favorites over the years and know if your tastes match up. It makes shopping so much easier! This is a great post. Being truthful and consistent is so important when building up and maintaining a successful blog. I get influenced by many blogs and other social media posts that I find out there. They all seem to peek my interest somehow and I love that about indulging into them. So worth it! Being authentic is your currency. Know your worth. You wouldn’t believe how often I’m approached by advertisers wanting me to “leave off” the fact that it’s sponsored. My readers trust me for a reason. Why would I ever violate that? It seriously boggles my mind to hear brands are still requesting this. I mean… !!! I really love this post. I feel like so many influencers get involved for the wrong reasons. Our readers and authentic bloggers can see right through. Great post! I think transparency is always key in the blogging world. I know I always look for that in the blogs that I read. I do believe in making sure I always disclose that i got paid. I believe is giving honest reports. Especially with disclosing. I mean, it’s the law, right? Best of luck to you. I’m so happy you wrote this because I’ve been saying many of the same things. I agree there is nothing wrong with bloggers following other bloggers – that can only help a brand’s reach! I’ve learned a ton from other bloggers! They are my people! Great post. I really think at the end of the day authenticity which leads to trust are the real deal breakers. Readers can easily pick up on “real” though they are some people who fake it very well but eventually it catches up with them. You make some good points. I think you’re totally right in your approach to building trust and credibility. These are things I look for! Ditto this! And the good ones are GOLD! Although I’m going to be honest, I find it hard to trust a lot of influencer’s out there. But there’s definitely a handful I rely on for honest feedback and creating genuine content, whether or not it’s sponsored. I think that’s key and not a lot of people know how to do that. I’m sorry you’ve had that experience and I think a lot of people can relate. It’s why I am so focused on being transparent and open. My readers deserve that. I am relatively new to the blogging/influencing world. I loved this article. Trying to figure out the influencer role in blogging is tough, and trying to figure out who is genuine is even tougher. As a new blogger/influencer it is so tough to not gobble up every opportunity that comes my way, your post has been a welcome reminder to stay genuine. Thanks so much for commenting! It can be tough out there but staying true and authentic will take you far. Best of luck!